Cannon James has a plan: Sign on as a contestant for his father’s new reality show, marry a blonde hand-picked by the producers, and walk away two million dollars richer. It’s all been arranged. Easy. Clean. No regrets. Until Ellie McAllister ruins everything by winning the viewer’s vote. Now he has to convince America that he’s head over heels in love with her. Not easy to do since she’s a walking disaster. Ellie McAllister has her own problems. She needs money, and she needs it now. Despite her parent’s objections and her belief that marriage is sacred, she signs on to The Wedding Game…and wins. Now she’s married to a guy she can’t stand, and if she wants her hands on the money, she has six months to make voters believe she loves him. Not easy to do since he’s the most arrogant man in America. It doesn’t take long for Ellie and Cannon to realize they’ve made a mess of things…even less time for their feelings for one another to change. But is it too late for them? More importantly, can the worst decision they’ve ever made actually become one of the best? 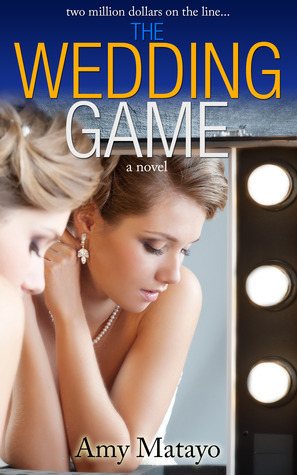 Narelle: I enjoyed reading The Wedding Game, Book 1 in the Reality Show series. I admit to being a skeptic regarding the marriage of convenience plot in contemporary romances. It works beautifully in historical romances because it wasn’t uncommon for people to marry for reasons other than love. It’s a hard plot to write successfully in the Christian/inspirational contemporary romance genre because we believe marriage is sacred and not something to be entered into lightly. Exceptional character motivations are required to make a modern day marriage of convenience romance story both realistic and believable. The Wedding Game nailed the character motivations for both Cannon and Ellie and set up a story full of emotional conflict for both characters. Ellie is a small town girl who is thrust into the celebrity spotlight when she wins ‘The Wedding Game’. She’s also hiding a big secret that she’s desperate to keep under wraps in order to protect the privacy of a loved one. Ellie comes across as snarky and rude during her initial interactions with Cannon. As the story progresses we learn why she believes he’s arrogant and an all round horrible person. Cannon is a wannabe actor who has lived a self-indulgent rich kid Beverly Hills lifestyle and made decisions that please his powerful and wealthy father. In a momentary act of defiance, Cannon chooses Ellie, America’s sweetheart, instead of the beautiful blonde who was his father and the producer’s first choice. The camera’s follow Cannon and Ellie’s daily lives as they share a made-for-tv apartment in LA and fight constantly. They can’t stand each other at the start of their temporary marriage and their enforced close proximity creates a lot of drama that’s filmed for their weekly reality tv show. Their romance is rocky and the sensual tension between Cannon and Ellie builds during the story. Cannon has secrets of his own and a whole new set of problems arise when Cannon and Ellie start to care for each other. The faith element in the story is very low key and readers who are looking for a romance with a strong faith message may be disappointed. I recommend The Wedding Game to readers who enjoy a light hearted contemporary romance that’s a little bit edgy and has humorous moments.